Movado’s new Master Series is defined as masterfully refined, meticulously engineered and even heroic. You can easily say the same for the rest of Movado’s timepieces, but this collection is truly a beautiful selection, both men and women’s designs. The Master collection is inspired by industrial and architectural expressions of the Bauhaus movement and has caught the eye of thousands worldwide. Movado sticks to their true motto (and definition) of “always in motion” by continuing to design one-of-a-kind timepieces. This particular watch is the newest addition to the Movado in the Master Collection. The 606297 Movado Master Woman’s Watch is exceptional in design and, of course, faultless in performance and durability. It features a solid stainless steel case with a layered diamond bezel. 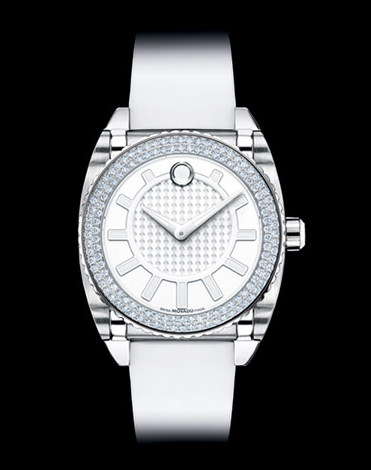 The white dial has a dot-textured inner circle pattern with raised and graduated luminescent hour markers. The traditional dot at the 12 o’clock spot resembles a push-button atop the textured circle. The scratch-resistant sapphire crystal keeps it looking perfect for years to come. The rubber strap is a pure white with a deployment strap for a wrist comforting fit. This Swiss quartz movement is water resistant in up to 30 meters. 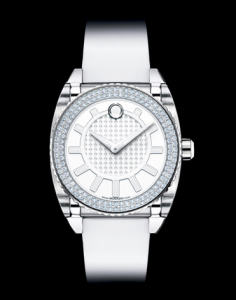 There are 130 fully cut diamonds on the bezel (0.845 TCW) which gives the 606297 Movado Master Woman’s Watch a perfect touch of femininity to the outer beauty while still holding true to the acknowledged flawlessness of the inner workings of the timepiece. It is available on Movado’s website, at various Movado boutiques and throughout many retailers in the US, Canada and even internationally.